Q: Do you provide care for all ages? A: Our office provides a complete range of adult and pediatric dental services for patients ages three and older. We offer friendly, spacious waiting areas for both adults and children, with books, magazines and videos to help pass the time. Our waiting areas and treatment rooms for children are colorfully decorated and child-friendly. A: We accept all major credit cards and most major dental insurance carriers, including Medicaid and PeachCare for children. Q: What types of technology do you use? Digital Dental X-Rays – Thanks to new digital technology, we can take X-rays of your mouth that use 90 percent less radiation that standard film X-rays. In addition, digital X-rays are immediately transmitted to a computer screen in our treatment room, so you don’t have to waste your valuable time waiting for your X-rays to be developed. Instead, you can see the images of your teeth instantly, and computer technology allows the X-rays to be enlarged, highlighted, inverted or even colorized, helping you and your dentist see hard-to-spot dental problems. Soft Tissue Laser – We use the latest laser technology to perform many procedures in our office that, in the past, might have been referred out to a specialist. Our dentists may use soft tissue laser technology to prepare teeth for root canal treatment and for many procedures involving gum contouring and removal. The soft tissue laser delivers pinpoint accuracy and reduces the bleeding associated with these dental procedures. High-Speed Curing Lights – We use high-speed curing lights in all of our treatment rooms to bond sealants and fillings. The time we save on each procedure means less time for you in the dental chair! Intra-Oral Cameras – Special digital cameras allow you and the dentist to see images of otherwise hard-to-see areas of your teeth and mouth. Our dentists may use this technology to show you problem areas, discuss treatment options, and let you view the results of your treatment while you’re still in the chair. Q: What kinds of precautions do you take to make sure your office is safe and sterile? A: To protect our patients and ourselves, our clinical staff wears masks, gloves, glasses and medical uniforms. We strictly observe each Occupational Safety and Health Administration (OSHA) guideline. All instruments are cleaned, disinfected and routinely sterilized as recommended by the American Dental Association and the Centers for Disease Control (CDC). Each surface in the treatment room is cleaned and disinfected after every patient. Q: Is it safe to go to the dentist if I’m pregnant? A: Yes; in fact, it is highly recommended that you visit the dentist during pregnancy. If you have Gum Disease during your pregnancy it can cause premature delivery and low birth weight. Studies indicate that periodontal disease progression during pregnancy contributes to preterm deliveries, especially very preterm deliveries (less than 32 weeks) which can put the baby at high risk for neonatal problems and/or disabilities. After dental procedures where local anesthesia was used, your child may accidentally chew on his or her lip, cheek or tongue to the point of injury. 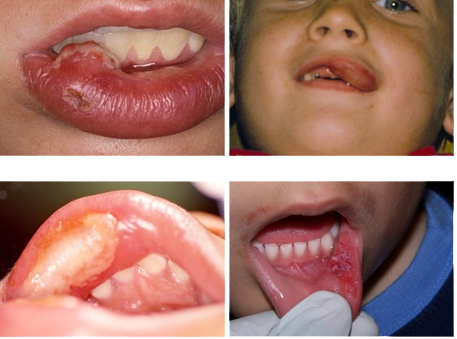 Chewed areas can become inflamed and swollen. Once the initial bleeding stops, the area will likely turn whitish in color. Do not be alarmed – this is normal and not a sign of infection. Luckily, these areas of the mouth heal very quickly. Call us if the wound is not healing in 5-7 days or if it seems infected. © 2015 Shurett Dental Group | All rights reserved.